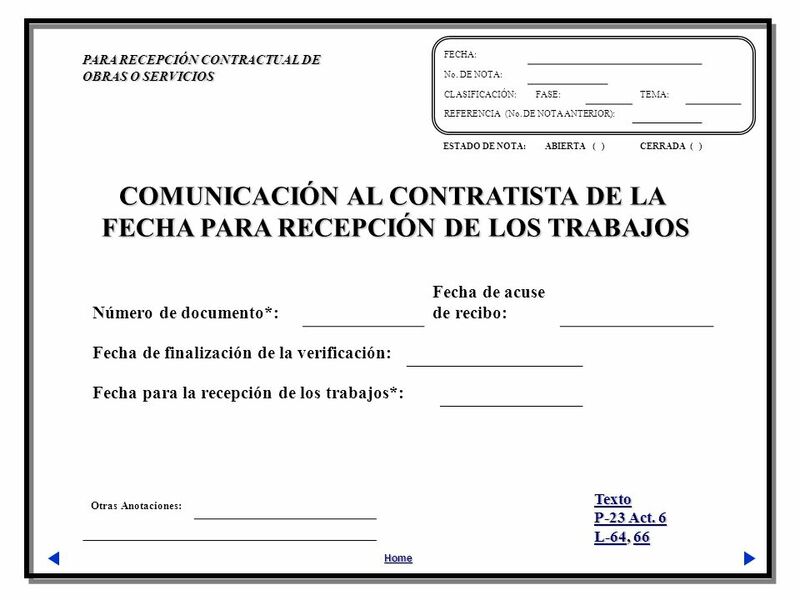 Descargar ppt "NOTIFICACIÓN DE LA TERMINACIÓN DE LOS TRABAJOS A LA RESIDENCIA DE OBRA"
MANUAL DE PROCEDIMIENTOS ADMINISTRATIVOS EN MATERIA DE OBRAS PÚBLICAS Y SERVICIOS RELACIONADOS CON LAS MISMAS M O P PROCEDIMIENTO ADMINISTRATIVO PARA. 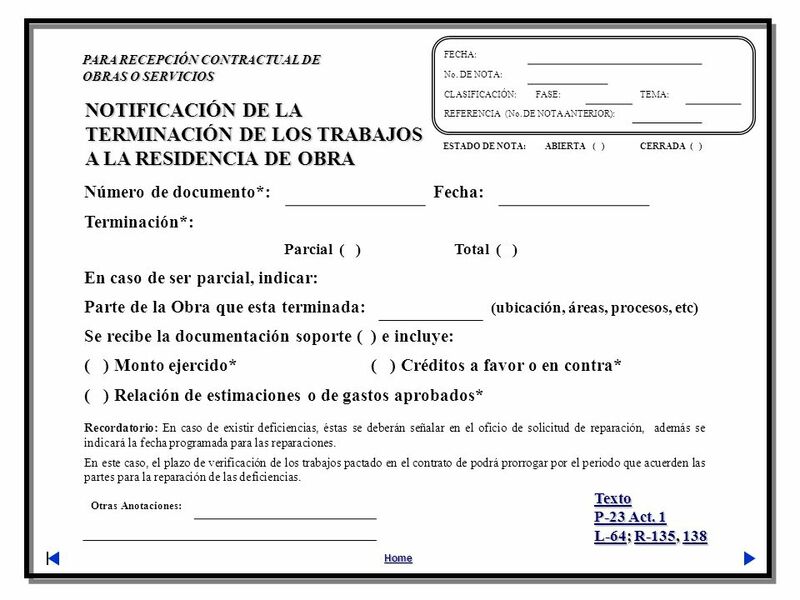 Otras Anotaciones: * Dato Obligatorio PARA ELABORACIÓN Y TRÁMITE DE GENERADORES DE OBRA Home FECHA: No. DE NOTA: CLASIFICACIÓN:FASE:TEMA: REFERENCIA (No. 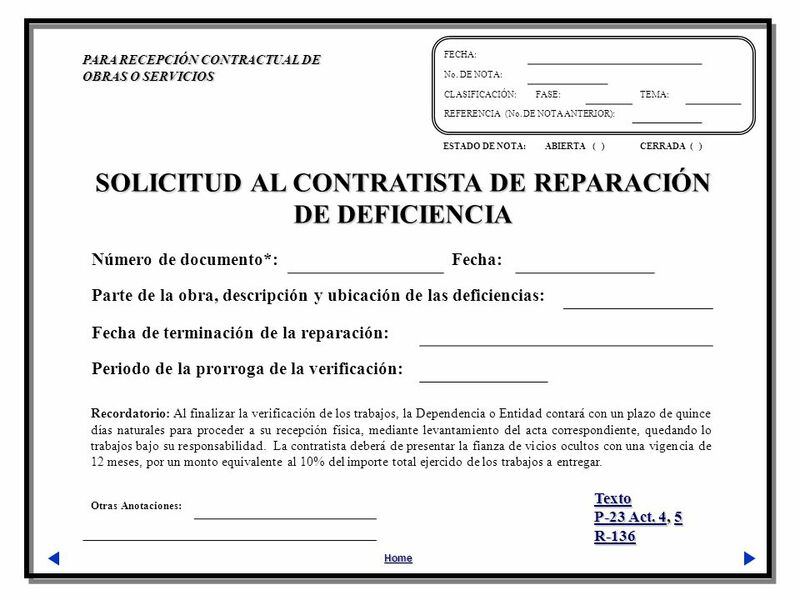 Home MANUAL DE PROCEDIMIENTOS ADMINISTRATIVOS INSTITUCIONALES EN MATERIA DE OBRAS PÚBLICAS Y SERVICIOS RELACIONADOS CON LAS MISMAS JULIO DE 2005 PROCEDIMIENTO. ¿DOS MESES PARA UNA SEGUNDA FASE? MADRID, 12 DE DICIEMBRE DE 2012 ANDREW WARD.